IKEA's commitment to making the lives of their customers better really shows in their new Life At Home series, which deeply researches the daily lives of city dwellers so IKEA can develop products that fit perfectly within their lifestyle. Sure, research is typically a huge part of many big brands' product development process, but few turn that research into super cool, interactive websites intended for consumers to play around with. Enter IKEA's A World Wakes Up website which gives you fun, bite-size data points from the morning routines of IKEA customers in 8 major cities around the world. 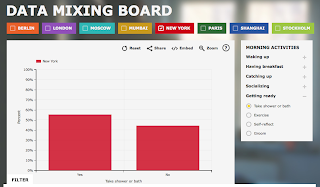 Data can be scrolled through for a nicely designed, story-telling like overview, or you can dig in deeper by click on the various Data Mixing Boards. Many of the data points are supported with helpful little tidbits of advice and scientific facts to make your mornings better. A fun way to spend 15 minutes digging around to see how your morning routine compares to those around the world.